Ilulissat Airport (Greenlandic: Mittarfik Ilulissat, Danish: Ilulissat Lufthavn) (IATA: JAV, ICAO: BGJN) is an airport located near the shores of Disko Bay, 1.5 NM (2.8 km; 1.7 mi) north-east of Ilulissat, a town in the Qaasuitsup municipality in western Greenland. It was built in 1983, replacing the old heliport. Air Greenland operates government contract flights to villages in the Disko Bay area. These mostly cargo flights are not featured in the timetable, although they can be pre-booked. Departure times for these flights as specified during booking are by definition approximate, with the settlement service optimized on the fly depending on local demand for a given day. Settlement flights in the Disko Bay and Aasiaat archipelago areas are operated only during winter and spring. During summer and autumn, communication between settlements is by sea only, serviced by Diskoline. The purpose of Ilulissat Airport has been debated in Greenland for decades; there has been pressure for runway extension from the local tourist industry and municipal authorities. An expansion considering constructing a new airport in Ilulissat is in progress. The expansion of the airport will feature a 2,200 m (7,218 ft)–2,800 m (9,186 ft) runway to let the airport receive direct international airliner flights from mainland Europe and the Americas. The airport will then (together with Nuuk Airport which will also be expanded) join or even replace Kangerlussuaq Airport as a primary hub, effectively becoming an international gateway to western and northwestern Greenland. 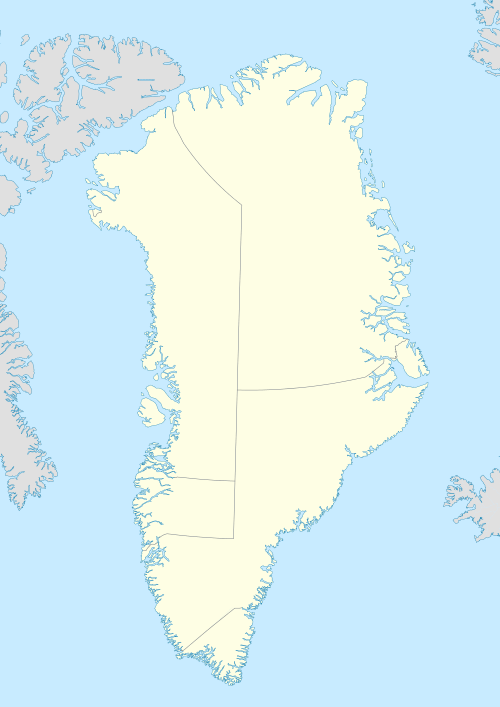 There is a general debate on extending or replacing most airports in Greenland, since most are ill located former air bases, or very short. Air Greenland de Havilland Canada Dash 7, "Nipiki"
Wikimedia Commons has media related to Ilulissat Airport. ↑ O'Carroll, Etain (2005). Greenland and the Arctic. Lonely Planet. pp. 172, 177. ISBN 1-74059-095-3. 1 2 "Booking system". Air Greenland. Retrieved 9 June 2010. ↑ "From Iceland to Greenland". Air Greenland. Retrieved 3 May 2016. ↑ Air Greenland, fare system rules Archived 13 July 2010 at the Wayback Machine. ↑ Diskoline timetable Archived 22 May 2009 at the Wayback Machine. ↑ "Mayors calling for airport improvements". Sermitsiaq. 10 September 2008. Retrieved 17 May 2010. ↑ "OPLEV VERDEN, OG LAD VERDEN OPLEVE OS". Qaasuitsup (in Danish). October 2014. Retrieved 4 December 2014.